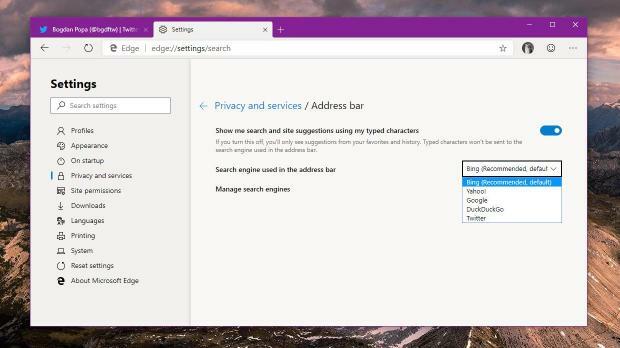 Like in Google Chrome, users can also configure their very own custom search engine in the new Microsoft Edge, and you can check out this article to learn how to do it. This means that despite the fact that Google wasn’t officially supported in the previous versions of Microsoft Edge, it was still possible to set it up.Only a Canary update for nowThis change is only available in the Canary version of Microsoft Edge, which receives updates every day and is only recommended for testing purposes. The Dev build, which is updated weekly, hasn’t yet received the change, but a new version should land any day now. Microsoft hasn’t yet published beta and stable builds of its new Edge browser, and they are expected later this year as new features are being added. Without a doubt, the stable version of Microsoft Edge will feature support for Google search as well. The existing builds of Microsoft Edge browser only work on Windows 10, albeit they can also be installed on Windows 7. However, Microsoft doesn’t officially support older Windows versions. A macOS version of the new Edge browser should also go live sometime soon, but details on the ETA aren’t available just yet. you can do this in the 74 dev build as well not only the 75 ones. i have had mine set to google since installing. what i want them to change is the new tab page does not seem to be any way to change that from bing search, so if you want to search with google you have to use the address bar. You're right, everyone can add so much search engines as much he/she wants, there is no restrictions. Also have not been. To open Google search as new page, simply use shortcut on favorites bar or install extension "Black menu for Google" and You'll have all useful Google links on your browser extensions area as one button with submenus. right but i want to eliminate bing altogether honestly. im hoping they add options for the new tab page so we can turn off the feed completely and have only a search bar to either google or other then bing so i dont have to use an add on to do that. otherwise im really liking this new version far far better.